 The clips on this page were contributed by veteran voice-over artist Jerry Immel from Atlanta, Georgia. He recorded these as a kid in Cleveland and Philadelphia in the mid and late 1950s. Along with Cleveland and Philadelphia, there are also clips for stations in Baltimore, Boston, New York City and sundry other cities. These audio clips were recorded in the summer of 1964 by life-long DX enthusiast Jeff Kadet, "K1MOD", of Macomb, Illinois (now deceased). He was residing in Needham, Massachusetts at the time he made these recordings, less than five miles away from the major TV stations in Boston. There's 29 clips in all from Boston, Philadelphia, New York City, and other cities in the Northeastern U.S..
have been authorized by the various television stations, networks or any other entity.